Question: My heating baseboards making noises when the boiler turns on. Why is that? Answer: Typically sounds made by vibrations coming from air traveling within the heating system pipes. There could be several reasons for this and the most basic one is that the system needs to be purged of all air. This must be done on a yearly basis. Have an HVAC technician service your boiler for a trouble free heating season. Question: My water bill is much higher than usual. why? Answer: Chances are there may be a leak. If there is no evident signs of leaks (i.e. wet floors/ceilings) there may be a leak either underground (i.e. heating pipe). But before jumping to conclusions please check for leaky faucets, showers, toilets and outside spiggets. When leaking, these fixtures leak constantly, which may accumulate into substantial amounts. I don’t want to shovel my driveway anymore! Question: I don’t want to shovel my drivay anymore! What can I do? Answer: You have two choices here. Choice number 1 is you get someone else to do it for you. Choice number two is you install hydronic heating in your driveway. The snow will melt as it land on your driveway without you ever needing to shovel or salt it! Water systems – this includes all fixtures that contain, carry or utilize water such as water piping, faucets, showers, water tanks and etc. Water treatment systems such as purifying, filtration and softening of domestic and commercial water are plumbing are of expertise. However fire sprinkler systems are typically are more specialized services. Natural Gas systems – gas piping distribution system and appliances. This includes natural gas barbeque grills, stoves/ranges and gas driers as well as gas piping to heating and hot water appliances and their commercial counterparts. Drain and sewage systems – any drain that moves or removes unwanted waste water and or other materials in a domestic and commercial setting is plumbing domain. Bathroom, kitchen, laundry, sump and ground water disposal and other commercial applications are definitely included. We hope this answers your questions about plumbing and when or if you have a question or concern we hope you will reach out to us. We’ll be glad to help. In 1992 there was an international environmental agreement that required worldwide phase out of HCFCs (hydrochlorofluorocarbons) due to their harmful impact on the ozone layer. HCFC-22 (also known as R-22, also known as Freon) has been the go to refrigerant for residential air-conditioning systems for over four decades. Unfortunately, releases of R-22, as those from leaks, contribute to ozone depletion. In addition, R-22 is a greenhouse gas and the manufacture of R-22 contributes significantly to global warming. As the manufacture of R-22 is being phased out as per agreement to end production of HCFCs, manufacturers of AC systems are offering equipment that has ozone-friendly refrigerants. Over the last several years the price of R-22 has increased exponentially while prices of the more popular and ozone friendly R-410a has dropped down. If you have a system that is leaking you will definitely notice that it is getting increasingly more expensive to fill it up. It is also very bad for the environment. There are two choices that we see fit, either fix the leak or replace the equipment. Do the environment and your wallet a favor and get to the core of the problem. If your equipment has failed and you are considering replacing it ask for the new R-410 refrigerant. If you have any questions please call Affordable A-Jay Plumbing Heating and Air Conditioning. We’ll be happy to hear from you. Does your home not have air conditioning and/or have an area of the house where ac air does have access to? You’re considering having ac put in but building ducts creates a project that is too costly and or too messy? You may want to consider ductless air conditioning. Ductless ac works the same as regular central air but more localized in a way like baseboards do in heating. Each area is its own zone with a thermostat that will regulate that area only. The units are hung on a wall and are super quiet. 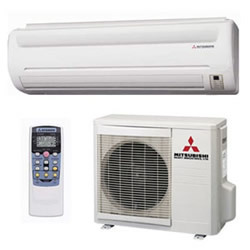 For example Mitsubishi, they offer many Energy STAR models with efficiencies going up as high as SEER 26. Their indoor units have a sleek modern look, are quiet and have multi-allergen filtration that also eliminates or reduces odors. The outdoor units are able to handle several zones simultaneously and are so quiet you can’t tell if they’re on or not. These units are eco friendly since they use less energy and use a refrigerant that has a significantly less impact on the environment. If this is something that you are considering, please give us a call for a no obligation free estimate. In case of emergency you and every one in your household must know basic response to water, sewage and gas leakage. First off, locate and label main water and main gas shut off valves. Test the valves for operation. Just because the valves are there it doesn’t mean that they’re fully functional. If found that they are not operational immediately call your local plumber to address the issue. Next educate every one in the house on how to turn each off and on. In case of water leak emergency, shut off main water and open faucet on the lowest floor to drain house. Call a plumber to attend to the issue. If you smell gas in an area and suspect a possible gas leak you should immediately call your utility provider’s emergency service line (in Rockland it’s Orange and Rockland 877-434-4100). If you feel comfortable you can turn the gas main off to stop the leak until a professional arrives. They will provide a free test to check for leaks and are most likely be able to point out the exact location of the leak. Next you must call a local plumber to fix the problem. If you have a backup in the drain line, you should find out if it’s a small local drain blockage or it is a main drain issue. If all drains are going down slow and the lowest drain in the house continuously overflows then it most likely a main drain issue. In this case you must stop using any and all water until problem is addressed. If all drains work properly except one or two local drains i.e. bathroom, then it’s an isolated drain issue. In this case restrain from using just the affected fixtures. Call a local plumber or sewer specialist. By following these procedures you will be able to keep the house safer and save money by stopping the damage from going further than necessary. Please feel free to call us with any questions and or concerns, we provide free estimates and have 24-7-365 emergency service. We can address all these issues for you swiftly and affordably. If you are considering purchasing a new grill, consider getting one that can be connected to your main gas line. For one you don’t have to replace those tanks, which have a tendency to go empty at the most inopportune moments. 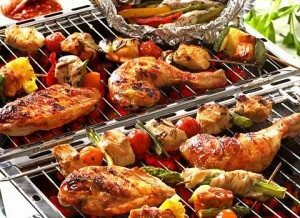 A gas grill line connected to your house may be installed discretely and away from sight. It would also come with a local easy access shutoff. Most grills also come with a quick disconnect for mobility, cleaning and seasonal removal if necessary. So take back the summer and never run out of gas on your grill. Call us and we will give you a free estimate with your project. “How often should we change our filters on the heating and air conditioning system?” The answer is not so simple. Thing is every house and every situation is different. Sometimes it must be changed every 2-3 weeks and sometimes one can go 4 months with out changing the filter once. Here is how you can determine this for yourself. This will require some testing and keeping track on your part though. But let’s start from beginning, why does one need air filters. First and foremost filters clean the air you breathe. So a clean filter benefits your health greatly. Second, a dirty filter gets clogged and become not as porous (that may not be the proper term, but I’ll stick with the term). An HVAC system is designed to move a certain minimum amount of air per given period of time. Perhaps for heating furnace that is not as critical as it is for air conditioning. An air conditioning air handler coil contains refrigerant that boils at a very low temperature (r-22 -41.62°F and R410A -55.3°F) So when it enters the coil it must be warmed up with a certain amount of airflow to prevent it from freezing. By having a dirty/ clogged filter airflow is reduced, which gives it a “frozen coil” effect, which if unchecked can create severe problems. So, that being said the best thing to do is keep the filters clean and changed as often as needed. How often? We’ll get to that in a sec. Being to a lot of houses I can tell you that the situation is different per house. Kids and pets tend to create dust. Bigger houses will tend to have more dust. How clean is the house? How much foot traffic? and etc. Now that you understand why here’s the how. Check your system’s filter every week from new change. Count how many weeks it took to get to lightly dirty. Do not wait until its opaque. There are different types of filters. The pleated ones will trap more and smaller dust particles, but will get clogged much quicker. The cheaper “Brillo” looking ones are more forgiving but will let more dust through. They will each get dirty at different rates. Remember that a consistent filter change will enhance the performance and prolong the life of your HVAC system. We do new installation, new construction, and remodeling! With over 35 years of experience, we worked long and hard to develop a reputation as a high quality and professional service company. You can count on us for 100% satisfaction, personalized services, and low prices.